Two Jewels Just Added At Arkeyn Steel’s Roster! …LYRICAL US MELODIC METAL FROM THE ICONS OF KANSAS! (For orders ONLY through our online store)! US melodic Power metal quintet Dreemwich, was formed in 1988 in Topeka, Kansas with the intricate guitar work of Kevin Streeter, powerful drums of Steve Case, precision bass of Jeff Dodd, soaring vocals of Matt Cavanaugh and electrifying guitar of Ronnie Fields. The band focused on writing and recording their debut self titled EP – first released in 1989. After this first release and gaining professional management, the band began performing a series of live gigs in and around Topeka and Kansas City, Missouri, helping to build a following of dedicated fans. Five months after the release of the EP, guitarist Ronnie Fields would depart from the band. To fill in temporarily, the band enlisted the services of two local guitarists. First, Steve Schneider added his blistering guitar riffs to the recording of a second 5 song demo and performed a few shows with the band. This was followed by guitarist Mark Case, who added his depth of talent to the band on it’s first mini tour through the Midwest and West Coast. Upon returning home, another line-up change would force the search for a new lead vocalist as well. In the spring of 1990, Dave Buller’s melodic guitar playing, along with Bryan Cowsert’s strong vocal delivery and energetic performance style, ushered in the next Dreemwich phase. This line-up recorded a three song demo of which two songs were included on the Midwest Metal Fest compilation released by Ground Zero Entertainment. Fresh out of the studio, this new incarnation of Dreemwich embarked on a 45 day tour of the East Coast and upper Midwest. Then in late 1990, a third line up change brought Karl Keller’s dynamic vocals along with the richly textured guitar work of Scott Shipps. After months of writing new material and numerous live gigs with Karl and Scott, Dreemwich would begin work on a fourth demo (unreleased & sadly unfinished) as well as perform showcases in Los Angeles and Chicago before disagreements with management led to their disbanding in 1992. Arkeyn Steel Records have managed to track down this excellent band. We dug very deeply and release their entire back catalogue (17 songs in total, more than 78’ minutes of music including everything that the band has ever recorded). It seemed impossible but we finally made it. As usual all songs remastered from original tapes for the best sound journey. Comes in 16-page fat glossy booklet with lyrics, band story and full of unreleased pics. Another US Lyrical Power jewel will be released the way it deserves! Fans of QUEENSRYCHE, FATES WARNING, LETHAL, HEIR APPARENT, RECON & SACRED WARRIOR must have it! THE US POWER/SPEED METAL PIONEERS OF CHICAGO WITH SCOTT HUFFMAN (Syris, Spirit Web, Mindwarp Chamber, Twelfth Gate etc) ON VOX, GIVE US ONE OF THE BEST REISSUES OF 2017! In 1991, four high school friends in the Chicago suburbs; Steve Stefani, Michael Konopka, Adam Polzin, and Oliver Schmidt, united to form a band and produce a killer metal sound that would violate the ears of every man, woman, and child in the universe. Countless nights and weekends in Mike’s parent’s basement soon followed, and after crafting a handful of original songs, the band was ready for a vocalist. An ad placed in the local Illinois Entertainer magazine was answered by Scott Huffman (Syris, Spirit Web, Mindwarp Chamber, Twelfth Gate etc). Scott’s strong vocals and original lyrics were a perfect match for the shredding guitar, thunderous drums, and mind-blowing bass that gave the band its signature sound. Lords of Meat was born! In 1993, “A Mind A World Away” was recorded at Metropolis Studios and released on 500 cassette tapes, with another 100 CDRs soon to follow. Arkeyn Steel’s “A Mind A World Away” CD features both the band’s demos – “A Mind A World Away” (1993) and the unreleased Live Demo 1992. This great reissue features re-mix of the songs that appeared on the bands Demo 1993 and as usual all the songs have been digital remastered for the best possible sound experience. Unreleased photos plus bio and lyrics complete the package. Don’t miss your chance to listen this perfect US metal power!! For fans of Oliver Magnum, Helstar, Syris, Toxik, Vicious Rumors! ARKEYN STEEL RECORDS ASK, IF YOU ARE READY FOR A FANTASTIC SOUND TRAVEL BETWEEN, QUALITY US METAL AND NWOBHM! Damascus is HERE! Arkeyn Steel records and Damascus are proud to announce the re-issue of the classic LP-Tape album, Forest of Dreams. Formed in 1985 in Muskegon, Michigan (USA), Damascus started by playing rock and metal songs of the era. The band soon began writing original music! Damascus hit the studio in 1989 to record their catalog of songs. 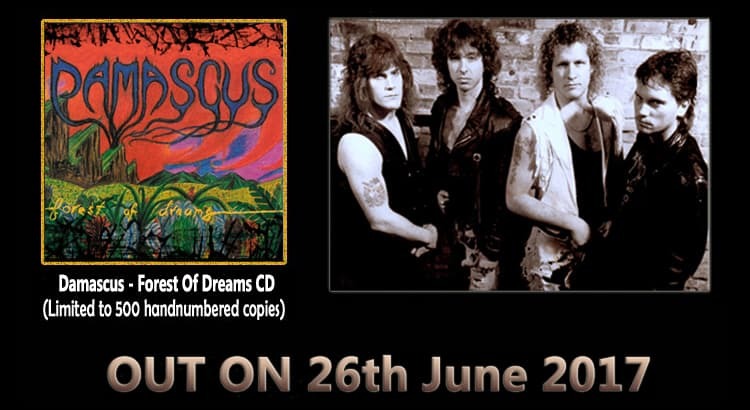 Originally released as a self-produced run of 1,000 cassettes, Forest of Dreams (LP-Tape, 13 songs/55’ mins) brought Damascus’ melodic US metal to a wide audience. The album received airplay in Michigan, and on the legendary Z-Rock! national station. Fans of MALICE, LEATHERWOLF, BREAKER (US), SAXON, JUDAS PRIEST & GRIM REAPER will love it! Raging leads and powerful guitar melodies, dreamy keyboards, thundering bass and drums, and soaring vocals are the hallmarks of Damascus. Discover this classic album, comes in 12-page glossy booklet with lyrics, band story and full of unreleased pics, cover with original fantasy artwork and remastered from original tapes by Arkeyn Steel Records. Available in hi quality CD format for the first time ever! ARKEYN STEEL RECORDS WITH GREAT PRIDE ANNOUNCE THE PERFECT CROSS BETWEEN LYRICAL US POWER METAL & INTELLIGENT PROG METAL! At last! One of the most prominent bands of US Power/Progressive Metal is finally here! Arkeyn Steel Records resurrects the music of legendary Apocalypse from Michigan, USA. Here we have the perfect cross between lyrical US power & intricate prog metal, in the vein of Queensryche, Lizzy Borden, Lethal, Crimson Glory, Heir Apparent, Syris, Zaxas & Talisphere, featuring killer vocals and exceptional guitar work. 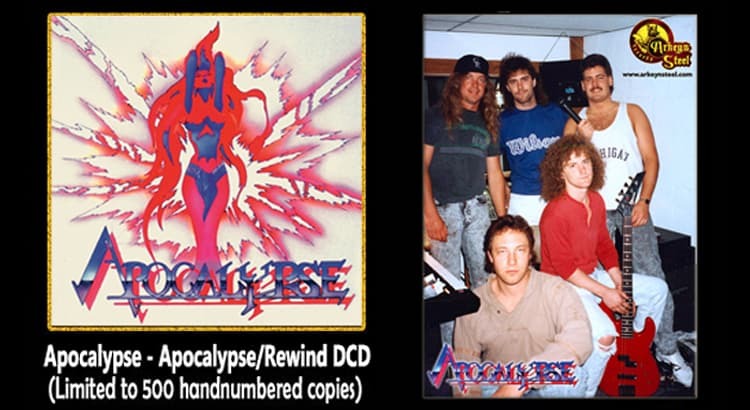 “Apocalypse/Rewind” DCD includes both the band’s private albums, “Apocalypse” (1994) and “Rewind” (1998). Two discs, 16 tracks in total, over 92’ minutes of music, including everything the band ever recorded. All the songs have been remastered by Kostas Scandalis (Wardrum, Horizons End) at Infinity Studios and will be presented on a great 2-CD package, with a 16-page glossy booklet, featuring original covers, never seen before band photos and lyrics! Do yourself a favour and listen to the ultimate US Power/Prog Metal experience! This is a one of a kind US Prog/Power jewel, which will finally be released, in a manner it always deserved to! Do not miss it! ARKEYN STEEL RECORDS Present the second part of the ultimate Anthology of Legion’s STEEL! NOTE: Only unreleased stuff here! Legion from Augusta, Georgia, USA was founded back in 1985 by multi-instrumentalist Doug Calloway. His vision to deliver a powerful mixture of Heavy/Power and Speed Metal performed by a fully dedicated band was clear since the very first rehearsal with the vocalist Loy Mitcham. With Marvin Mitcham on drums and Chuck Goodwin on bass, Legion became a four piece metal force. They recorded and presented -live and in studio- some high class steel in their very own way. Imagine a very powerful mix of early Metal Church, Deadly Blessing, Omen and Enchanter and you can understand the basic musical vibe of Legion. From 1985 until 1994 Legion recorded lots of material. Unfortunately due to various difficulties only an official independent LP tape release has seen the light of day back in 1991. 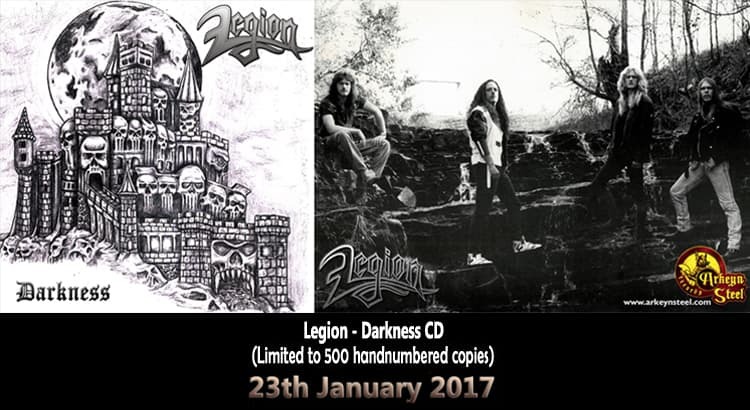 An original copy of the “Darkness” LP-tape is one of the wildest dreams of the few people worldwide who know about Legion’s existence. Arkeyn Steel Records have managed to track down this magnificent band. But we knew from the very first time that a simple re-release of the “Darkness” LP tape wouldn’t do full justice. To release their entire back catalogue was the main goal. It seemed impossible but we finally made it. So here they are: Two separate CD releases representing the Legion saga. The first one is called “Darkness” and it will feature the entire “Darkness” LP-tape (1991) plus the band’s fourth unreleased album “For We Are Many” (1994). More than 77 minutes of music, the Legion way. The second release is called “Bible Of Stone” and it will feature the band’s unreleased “Bible Of Stone” album (1989) plus their unreleased compilation album “Monsters” (a wide selection of rare and unreleased tracks, 4 track and rehearsal recordings from the band’s first era (1985-1987) plus their 1985 2-song demo. More than 72 minutes of music, capturing the band’s first era! Everything is re-mastered direct from 24track tapes packed with lyrics, info and bio. Handmade cover artwork by Doug Calloway himself completes the puzzle giving to the reissues this obscure, fantasy artistic touch that fits extremely well with the band’s vision. Legion is not just another lost Metal band from the 80s. Legion is the great example of force, passion and dedication to steel, transformed into music. No, back in the day Legion got no big record label and big budgets on their side, they got no promoters and managers to spread their music around. They simply got their magnificent talent and their dedication to music. They remained active recording their stuff, letting no difficulties touch them. Well now it is time for all the music to see the daylight the way it deserves. Get ready for the ultimate Metal experience! Get ready for JOIN THE LEGION! ARKEYN STEEL RECORDS Present one of the most obscure and well hidden gems of steel finally faces the daylight! 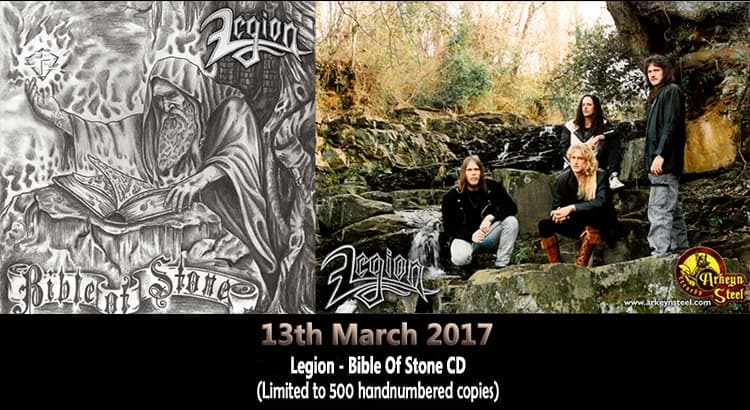 The second release is called “Bible Of Stone” and it will feature the band’s unreleased “Bible Of Stone” album (1989) plus their 1985 2-song demo. A wide selection of rare and unreleased tracks, 4 track and rehearsal recordings from the band’s first era (1985-1987) is also included. More than 74 minutes of music, capturing the band’s first era! ARKEYN STEEL RECORDS ANNOUNCE THE LONG-AWAITED OFFICIAL RELEASE BY THE WORSHIPERS OF THE SWORD! Finally! Worshipers of the sword return! 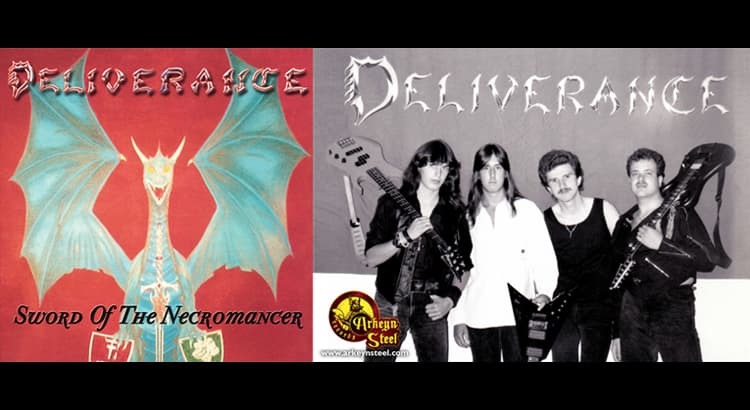 Arkeyn Steel Records resurrects the music of Deliverance from New York, USA. This amazing band delivered mystical Epic Power Metal, combining the powerful vibe of bands like Omen, Liege Lord and Medieval Steel plus the epic obscure feeling of bands like Majestic Ryte and Legioned Marcher. “Sword Of The Necromancer” CD features both the band’s demos -“Deliverance” (1990) and “Sword Of The Necormancer” (1991) – plus 5 bonus live tracks (“Live at Nobody’s NYC” – 1990). 16 tracks in total, over 78’ minutes of music including everything that the band has ever recorded. As usual all the songs have been remastered from scratch for the best possible sound experience. Unreleased photos plus in depth bio and lyrics complete the package. Don’t miss this ultimate Epic / Power Metal experience! Justice is finally done! The Necromancer will rise! 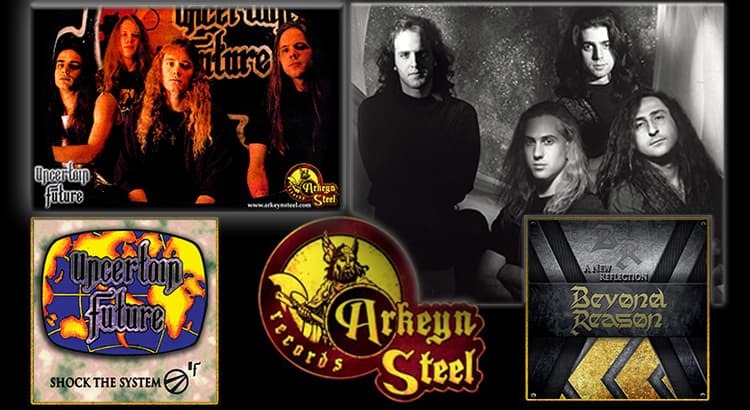 ARKEYN STEEL RECORDS RETURN BACK, FAST AS A SHARK, WITH 2 NEW RELEASES FROM OLD FORGOTTEN DIAMONDS! FINALLY! 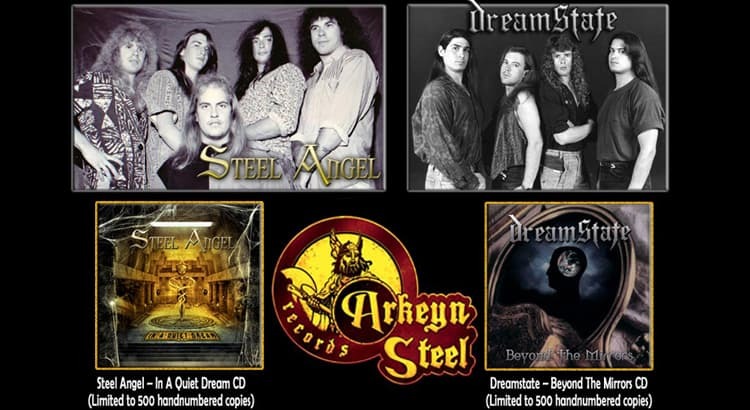 Arkeyn Steel Records brings back to daylight the music of Steel Angel from Bradenton, Florida, USA. Their “Inquiete” LP-Tape was released back on 1992 only on a hundred cassette copies for family and friends. By this time the band had already split due to the death of their vocalist Jason Flanders on a car accident. Also included as bonus first unreleased demo from 1990. This masterpiece available first time on CD. Here we got the finest melodic US Power Metal you can imagine, in the vein of Crimson Glory and Heir Apparent, featuring killer vocals and fantastic lead guitar parts. All the songs have been remastered from scratch and will be presented on a great package featuring never before seen photos, detailed interview and info. 10. What Child Is This? AT LAST! Arkeyn Steel Records brings back to daylight the music of Dreamstate from Fort Worth, Texas, USA. Their “Beyond The Mirrors” LP-tape was released back on 1994 and it is without doubt an excellent example of Progressive/Power Metal in the vein of Watchtower, Vicious Rumors, Savatage, Oracle (Jacksonville, US) and Queensryche. This masterpiece will be available first time on CD including 4 bonus tracks plus never before seen photos, lyrics and extended info. The bonus tracks include the complete -and unreleased- “Strange Rooms” demo sessions (three tracks from 1997-1998) plus the “Mind Gallery” song which was recorded as part of a compilation promo CD, back in 1996. 14 songs in total, more than 70’ minutes of music including everything that the band has ever recorded. As usual all the songs will be remastered from original tapes for the best possible sound experience. Another US Prog/Power jewel will be released the way it deserves! Don’t miss it! 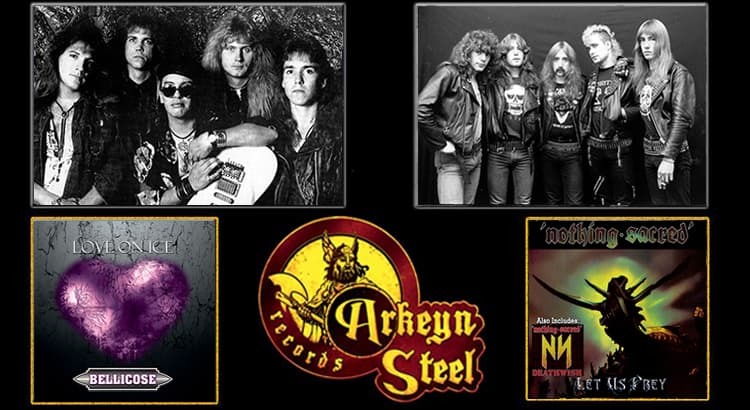 ARKEYN STEEL RECORDS return with 4 new brilliant US Power Metal releases! They say great things come to those who wait…and the wait is over for Damien Black fans! Arkeyn Steel Records is proud to release the new full length Dead Of Winter from Orlando, Florida’s melodic power metal masters Damien Black. This epic release features re-recordings of the songs that appeared on the bands first (Black Reign) and unreleased second demos plus “Black Reign” demo from 1992 original recording, mix are included as bonus. Not only have these songs never been released before on CD, the new recordings feature a heavy, modern production while retaining the trademark Damien Black sound, all wrapping in a stunning package with 12-pages booklet featuring never before seen photos, lyrics and bio. For those new to Damien Black and fans of US power metal in the vein of Vicious Rumors, Queensryche and Savatage, this release is a must. Dead Of Winter is a showcase of glass shattering vocals, amazing guitar work and a pounding rhythm section, all delivered in songs that are epic and powerful. 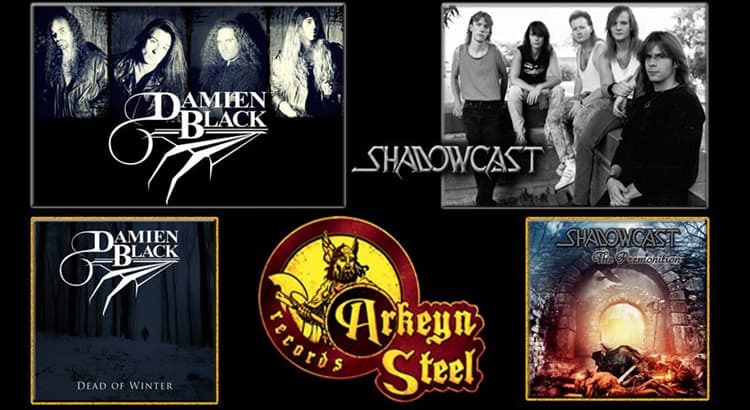 Arkeyn Steel Records is proud to announce the re-release of Shadowcast, “The Premonition”. Shadowcast comes from Dayton, Ohio and delivered a fine mixture of US Melodic Metal with Power/Progressive touches back on the 80s. Includes the renowned first demo, “Necropolis”. Local station WCWT reviewed and compared them to Fate’s Warning, Queensryche, Leatherwolf and Fifth Angel. “Private Reality” was featured on Clear Channel’s WAZU and had a feature interview on their local music segment. This is the best tribute for Shadowcast to see both demos first time on CD. This band earned a loyal following and packed the house by playing hard hitting originals mixed with metal classics. Digital remastered by Randy Davis (Shadowcast, Wrathskeller, Sartori), artwork by Cadies Art (DragonForce, Doro). FINALLY! Arkeyn Steel Records is ready to daylight the music of Osiris from Vancouver, Canada. “Resurrection” including five demos (1986, 1987, 1989, 1992, 1993), and many bonus material from outtakes, rehearsals and compilation track. This masterpiece will be available first time on CD. Here we got the finest melodic Canada Power Metal you can imagine, in the vein of Queensryche, Fates Warning, Crimson Glory and Heir Apparent, featuring killer vocals and fantastic lead guitar parts. All the songs have been remastered by Kostas Scandalis (Wardrum, Horizons End) at Infinity Studios and will be presented on a great double CD package with 16-pages booklet featuring never before seen photos, lyrics and bio. Wrathskeller from Dayton, Ohio, USA delivered fine US Power Metal in the vein of Armored Saint, Metal Church, Deadly Blessing, Gargoyle and Glacier. Arkeyn Steel Records is pleased to announce and brings back to light the entire demo catalogue of Wrathskeller. “Eve of the End” including three demos (1986, 1987, 1989), one demo/audition from 1988 with Dwight Bowden (Paragon, OH, USA) on vocals and bonus from Recording Workshop Sessions and live from 1989. From the depths of Dayton, throughout the late 1980’s, Wrathskeller cranked out a heavy stream of crushing US Power Metal. 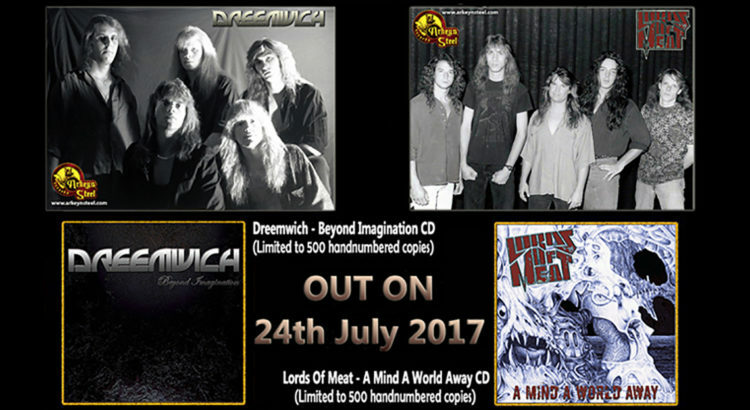 This young, hardworking band produced an extensive catalogue of original power metal over several years of writing and recording. Remastered by Randy Davis (Shadowcast, Wrathskeller, Sartori), artwork by Cadies Art (DragonForce, Doro). ARKEYN STEEL RECORDS STRIKES BACK! ONLY FIRST 50 COPIES WILL ARRIVE WITH PRO-PRINT PROMO PICTURE! Uncertain Future from Kansas City, Missouri, USA delivered fine Power / Prog Metal in the vein of Queensryche, Lethal, and Mystic Force. They have released one demo tape back in 1991 and a private CD two years later (1993). Those aware of the band’s existence were always keeping a high slot on their want lists for those releases, especially for the “Shock The System” private CD which was limited to 500 copies and was sold for more than $300 among collectors. Well now the search is over. Arkeyn Steel Records brings back to light the entire catalog of one of the finest Metal bands from Missouri. The Arkeyn Steel release includes the entire “Shock The System” private CD (1993), the entire “Peace By Peace” demo (1991) plus the band’s “Floodgate” unreleased demo (1999). Get ready to satisfy your thirst for Ryche-influenced US Power / Prog Metal under a real shock! Everything has been re-mastered and packed with lyrics, inner notes and unreleased photos under a concept based on the original “Shock The System” CD artwork. Beyond Reason from Westchester, New York, USA delivered technical Power / Speed Metal in the vein of early Metal Church, Intruder and Final Assault. It is this fine mixture of raw power with technical elements that makes this band so special. Their two demos released in the early 90s have disappeared ages ago. 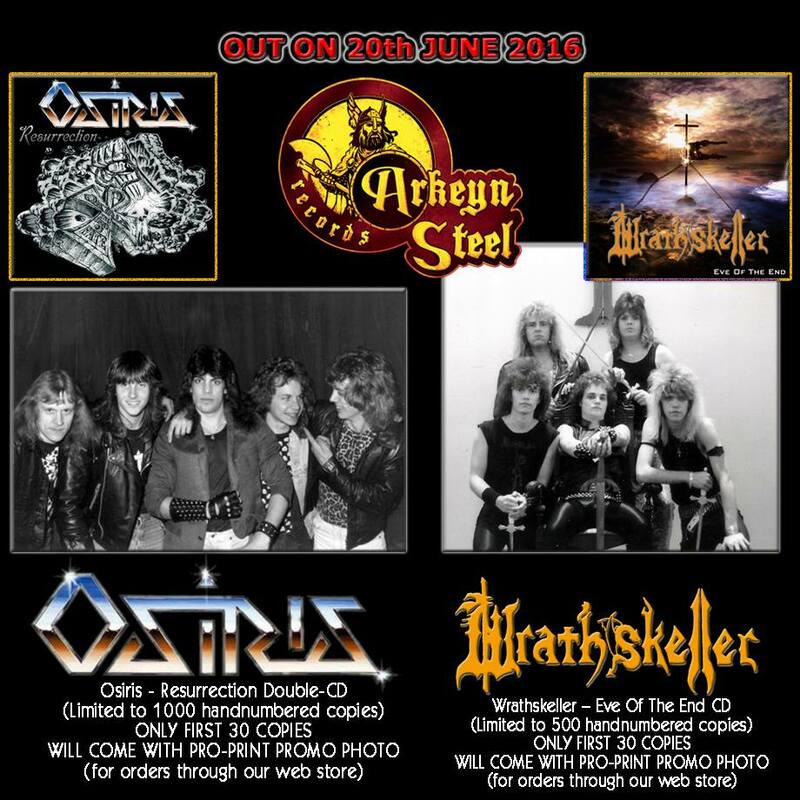 Arkeyn Steel Records has managed to track down the band, presenting everything they have officially recorded and released plus all their unreleased material on a single CD. “A New Reflection” includes the “…Distant From Reality” demo (1990), the “Beast Of Change” demo (1992) plus 3 unreleased tracks from 1991. Get ready to feel the absolute power of a great band! Everything has been re-mastered from scratch, brought to you in a great package including lyrics, a biography and lots of never-before-seen photos. 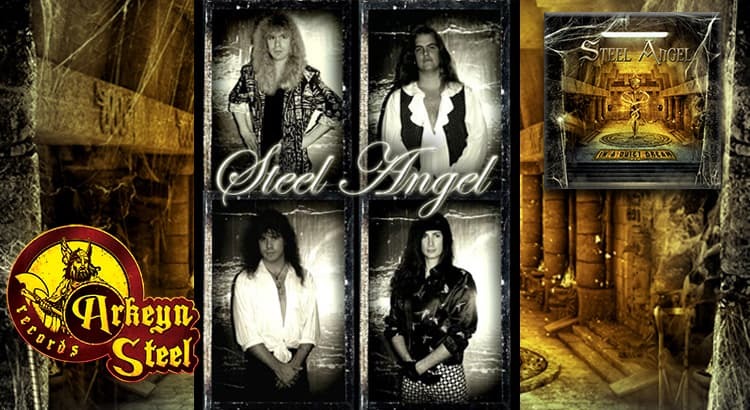 STEEL ANGEL (US-FL) Deal with Arkeyn Steel Recs! FINALLY! Arkeyn Steel Records brings back to daylight the music of Steel Angel from Bradenton, Florida USA. Their “Inquiete” full length was released back on 1992 only on a hundred cassette copies for family and friends. By this time the band had already split due to the death of their vocalist Jason Flanders on a car accident. This masterpiece will be available first time on CD. Here we got the finest melodic US Power Metal you can imagine, in the vein of Crimson Glory and Heir Apparent, featuring killer vocals and fantastic lead guitar parts. All the songs have been re mastered from scratch and will be presented on a great package featuring never before seen photos, lyrics and info. Bellicose – Love On ice + Bonus ||| Nothing Sacred – Let Us Pray + Deathwish + Bonus ||| OUT NOW! Arkeyn Steel Records is pleased to announce the re-release of the “Love On Ice” CD by Dallas, Texas Melodic Metallers, Bellicose. One of the best Melodic Metal albums from USA which has been out of print since ages, will be re-released the way it deserves. The band’s unreleased demo from 1984 plus two fantastic unreleased tracks from 1988 are included as bonus. Remastered by Kostas Scandalis. Package comes on completely new artwork by Kostas Athanasoglou plus never before seen photos and in depth liner notes. Fans of Riot, Lethal, Leatherwolf, Fifth Angel will LOVE this! Limited in 1000 handnumbered copies! ONLY first 100 copies will come with extra promo pro-print photo (for orders through our web store). From Melbourne, Victoria, Australia, Nothing Sacred delivered a crushing mix of Power/Speed Metal back on the 80s. Arkeyn Steel Records re releases their -both out of print- “Deathwish” (EP-1985) and “Let Us Pray” (LP-1988) full length on one CD. The three tracks that the band recorded for their never released second LP (“Nemesis” 1989) are included as bonus together with a selection of live tracks that re present the band’s raw power. Total 79′ minutes of Power/Speed Metal to bang your head at. Re-mastered by the band, packed with many photos, lyrics and info. Front cover by Joe Petagno (Motorhead, Pink Floyd, Led Zeppelin, Nazareth etc). 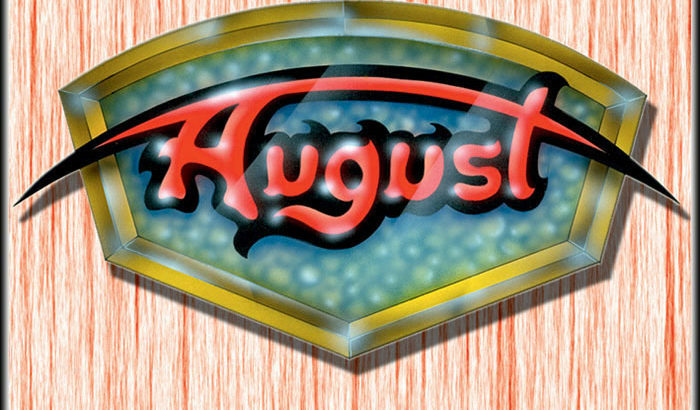 AUGUST – August – OUT NOW! August, the new release of Arkeyn Steel Records is out now! A delicate US prog/power with unreleased demo of the band and great unreleased material! The release date is 16th of December 2013. Limited in 1000 handnumbered copies!